The first two Voodoo Doughnut – Rogue Ales collaboration beers were interesting to say the least, and well worth trying at least once. After all where else is it possible to find a maple bacon doughnut ale, or a chocolate, peanut butter, banana ale. Sure, a wider selection of odd beer flavors is being brewed every year, just look at the amazing selection coming out of the Shorts Brewing tap-room. However, with very few exceptions, Rogue is doing something no other brewery is even attempting. Hopefully more commercial breweries will follow the lead and brew odd flavored beers for distribution. I enjoyed the previous two Voodoo Doughnut beers, and was looking forward to this newest release from the moment that I heard about it. I mean come on, who doesn’t like a good jelly doughnut, and personally I love raspberries, so I couldn’t wait to get my hands on a bottle. Unfortunately, Wisconsin always seems to get these new Voodoo Doughnut beers over a month after their release, so it was a long month of checking liquor store shelves for a bottle. The Voodoo Doughnut Pretzel, Raspberry & Chocolate Ale is based on the Voodoo Doll doughnut, a raised yeast doughnut filled with raspberry jelly topped with chocolate frosting and a pretzel stake. Sounds pretty good, eh? Currently Voodoo Doughnut Pretzel, Raspberry, & Chocolate Ale has a score of 79 over at Beeradvocate. At ratebeer, it has a score of 69 overall with a 92 for style. A Collision of Crazies. 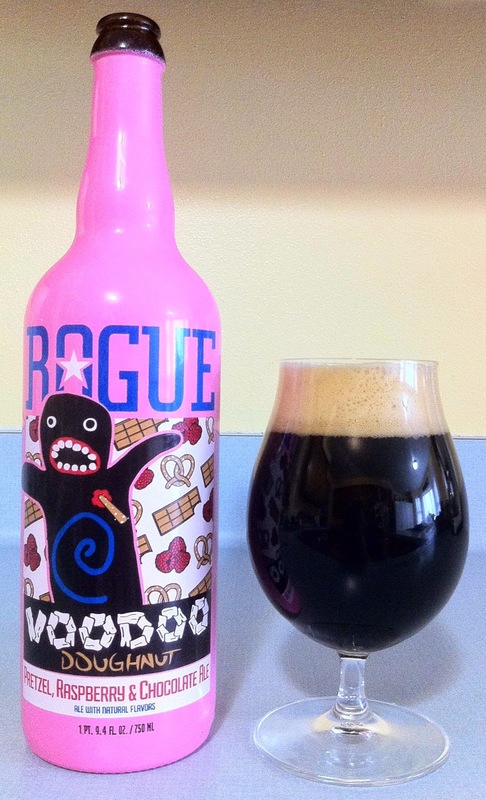 Rogue Ales has again collided with Voodoo Doughnut to create Pretzel, Raspberry & Chocolate Ale! Voodoo Pretzel, Raspberry & Chocolate Ale pours a slightly hazy deep mahogany with ruby highlights. It sports a thick, creamy head with moderate breakup that has surprisingly little retention. The aroma begins bready with subtle toasted malts, and milk chocolate, before developing a hint of raisin. Midway through the aroma there are notes of raspberry and slightly salty pretzels before a long, lingering chocolate finish. The aroma at least hits all the expected notes, with the right mix of doughnut-y malts, raspberry, pretzel, and chocolate. The flavor has a strong, up front milk chocolate character that quickly transitions into bready malts with a hint of caramel. Subtle raspberries and pretzels come forward as the beer transitions to a lingering chocolate and pretzel finish. The after taste is dominated by pretzels, chocolate and bready malts. Voodoo Pretzel, Raspberry & Chocolate Ale has a medium-low body, with a moderate carbonation level. Out of the bottle, the raspberry flavor leaves much to be desired, it never really came forward and screamed raspberry, leaving subtle notes on the tongue instead. I really would have enjoyed this beer more if there was a stronger, fresh raspberry flavor. In fact, the next time I buy a bottle, I am going to puree some raspberries and mix them in for the added effect. That isn’t to say that I didn’t enjoy Voodoo Pretzel, Raspberry & Chocolate Ale however, because I actually did. Much like the previous Rogue - Voodoo Doughnut collaborative beers, this one struck a note that feels almost more like a homebrew than a commercial product from one of the country’s top breweries. It has that playful quality that is all too often missing from commercial beers. This is definitely a beer that I will be buying again, and if the description above sounds even remotely interesting, it might be one you would enjoy as well. So, if you enjoy what you read up top, pick up a bottle the next time you are in your local liquor store, it should be easy to find on a shelf, being pink and all. Well, that’s all for today, Check back soon for another review! !